Cross-Post: So Long South! Hello Beantown! The following entry is a post that I’ve been meaning to cross-post to my blog for some time now! It was originally written for the Company I work for, highlighting tips on how to make a new city your own. Obviously, the move from Texas to Boston was my main focus here but what other pointers would you recommend? Slice: So Long South! Hello Beantown! Every city, especially Boston, has its own vibe and culture. It’s important to explore and find what you enjoy most! Ask for recommendations, read local publications and connect on social media to give a more well-rounded local perspective. I moved out to Boston without knowing anyone from Texas or Minnesota. It’s hard to believe but I don’t have family out here, either – and I have a large family! So, my first few weeks in Boston were devoted to meeting as many people as possible. Some of my closest friends are people I work with at SHIFT or people I’ve met through SHIFT (minus my roommates, of course). Although I’m not originally from Texas, I consider it one of two places I call home (Minnesota is my other home base). When I want to feel back in Texas but not physically be in Texas, I try to attend events hosted by my college’s alumni association (the Texas Exes). Now that it’s college football season, I’ll have a place to hang out every Saturday – and with people who can relate to what real Mexican and BBQ tastes like! This is not necessarily an option for everyone but one of the best decisions I made, when I got to Boston, was jumping in with SHIFT’s infamous softball team, the Benchwarmers 2.0. I am not an athlete and would never have participated in something like this anywhere else, but it was a great way to meet other SHIFTers from outside my team who I might not work with everyday. Additionally, I try to consistently contribute to our office’s events (i.e. making guacamole) and am assisting on 2.0 Task Force. These activities have been so helpful in my transition into a new office and professional role! 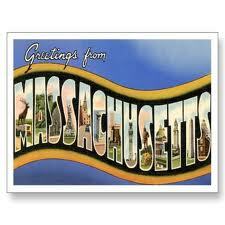 Three months in Boston has flown by for me – though if you ask some SHIFTers, they’ll swear I’ve been here longer! Obviously, every person has to figure out how to make a transition after a huge move work best for them but hopefully, the above will give you a great jumping off point. What makes a move even better is having a lot of support also, which I can say from personal experience, has been one of the greatest things about working for SHIFT – the support from colleagues (and now friends). This entry was posted on Thursday, September 30th, 2010 at 8:16 am	and posted in Uncategorized. You can follow any responses to this entry through the RSS 2.0 feed.